After years of being tangled up in the esoteric Eskaya script from the southern Philippine island of Bohol, I have an article in the latest issue of The Australian Journal of Linguistics that summarises everything that I’ve learned about it. This is certainly not everything that there is to know on the subject and it’s been a case of ‘the more you look, the more you see’. I’ve decided it’s high time for me to look away before I either damage my eyesight or come up with another analysis. You can view and download it here, and if your institution doesn’t give you access please grab the pre-publication version here. To consider only at its outward graphic form, the Eskaya script appears ostentatiously calligraphic with a profusion of loops and curls that seem to mimic cursive handwriting in the Roman script. But the complex system underlying the script is just as excessive, with multiple mechanisms for representing linguistic sound. This abundance goes against the grain of how we might assume ordinary writing systems to evolve: towards greater simplicity and consistency. Eskaya is no ordinary writing system. It belongs to a little-known tradition of new indigenous systems that have emerged independently of major script families – even if they may be influenced by them in the graphic shape of some of the letters. 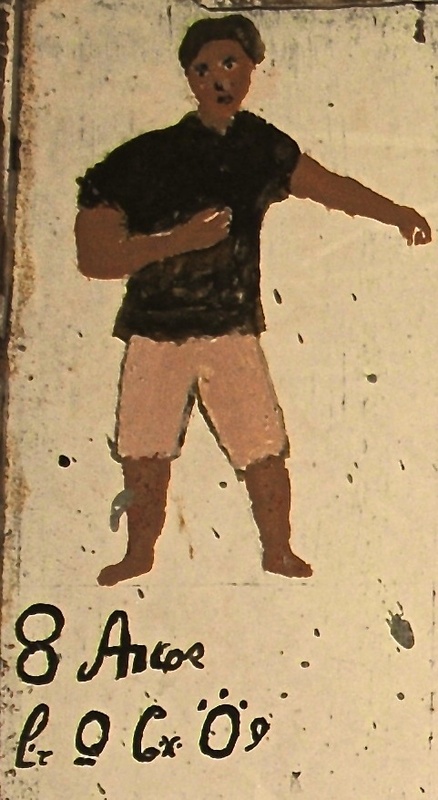 Cherokee and Vai are two such scripts from the nineteenth century, but a more fertile period of independent script creation was the first half of the twentieth century when talented individuals created dozens of new varieties of writing across West Africa, the Asia-Pacific and the Indian subcontinent. These emergent scripts were frequently associated with local demands for self-determination, ethnic revitalisation and a revised moral order, sometimes in the aftermath of violent struggle. Photograph by Cherry Policarpio 1991. 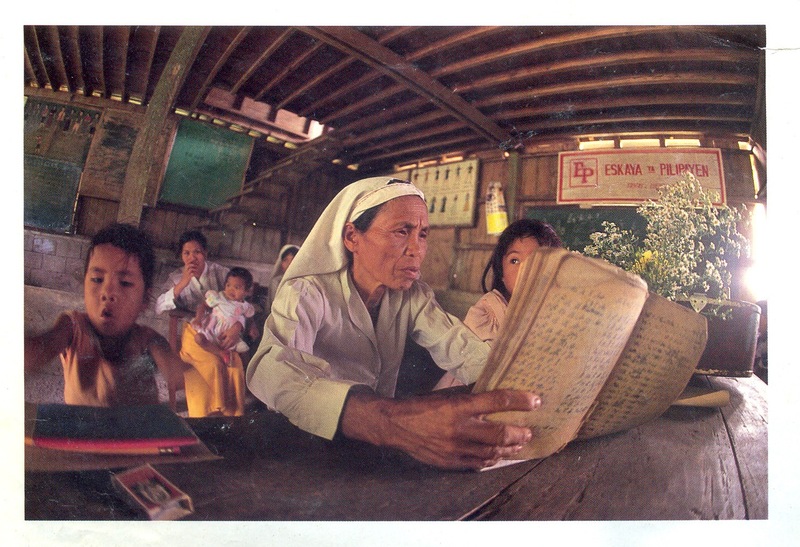 In the foreground is Raymonda Acerda, the child on the left is Jessame Maquiling. Eskaya writing has intrigued Philippine tabloid journalists and local enthusiasts ever since it became known to the wider world in the early 1980s. Mystics and lay historians have suggested an origin in any number of the following scripts and script families: Greek, Indic, Egyptian, Phoenician, Arabic and Javanese. But surprisingly, the most common theory is that both the script and its associated language are derivations of Hebrew, a notion that goes hand in hand with an increasingly popular view on the island that the people who use the script are descended from a Lost Tribe of Israel. By contrast the roughly 550 people who write in this script today contend that Eskaya was created by the heroic ancestor Pinay and later ‘revealed’ in the 1920s to the veteran rebel Mariano Datahan (ca. 1875–1949) whose Messianic agenda had by that time attracted a large following in the southeast of the island. Having endured brutal conflict and successive occupations, Datahan’s followers valued the script as an index of an uncorrupted pre-contact civilisation free from foreign influence. Pinay was more productive than most other script inventors since this ancestor was also responsible for creating an entirely new language—referred to as Eskayan or Bisayan Declarado—to go along with the script. As far as I know, the Medefaidrin language-script of Nigeria is the only other case of dual creativity of this type. The identity of Pinay—described as the first ‘Pope’ in the Philippines—is comfortably plural. It is not so much contested by Eskaya people as variously expressed. For some, Pinay was a man, for others a woman. In certain stories Pinay lived prior to Spanish colonisation while others place him or her in the contemporary period. The late chieftain of the Eskaya village of Taytay believed that Pinay and Mariano Datahan were the same individual, and this particular conceptualisation is most consistent with what I have been able to learn from my analysis of the script. Eskaya displays a plausible influence from the pre-contact alphasyllabic Philippine script in its use of inherent vowels and also in the emic metalanguage that scribes use to identify graphic elements of letters and their vocal realisations. There is, however, a much more obvious influence from the Roman alphabet, and from Hispanic orthographic rules. The borrowing of the ‘k’ form (for /-k/) among other pieces of evidence suggests an early twentieth-century origin (see the article itself for my explanation). What is so fascinating about Eskaya is that it violates every common sense maxim of how a writing system ought to work. While Eskaya is used for writing the Eskayan language, as well as Visayan and occasionally English, there is absolutely no ‘underlying rational of efficiency‘ when it comes to expressing the phonology or morphology of any of these languages. In fact, extravagant superfluity of both form and system is the order of the day. Eskaya is primarily a syllabary since its characters tend to express discrete syllables, but it nonetheless combines a wide array of systems: (cypher)-alphabetic, alphasyllabic, syllabic and ideographic. One aspect of the system that is particularly challenging from the perspective of a learner is the use of what I term ‘pseudo-diacritics’. These are one-off graphic elements for representing syllable codas but they have no independent or consistent sound value outside of the specific syllable they are attached to. In other words, a graphic element representing a glottal coda in one syllabic letter may represent a semi-vowel coda in another and an engma in a third. And although the hand-written reference syllabaries used by contemporary scribes include up to 1065 characters, only about 460 are actually used today. At least 37 recorded Eskaya letters represent sounds that are not phonotactically possible for the language. A peacock’s breakfast. Words in red are emic terms. I also argued that the lack of systematicity is a feature and not a bug, and that there is evidence that Pinay introduced a degree of deliberate opacity and misdirection. I suggested that its ‘inefficiency’, ‘superfluity’ and the huge personal commitment required for its acquisition make it both impenetrable to outsiders and appealing to its scribes and scribes-in-training. 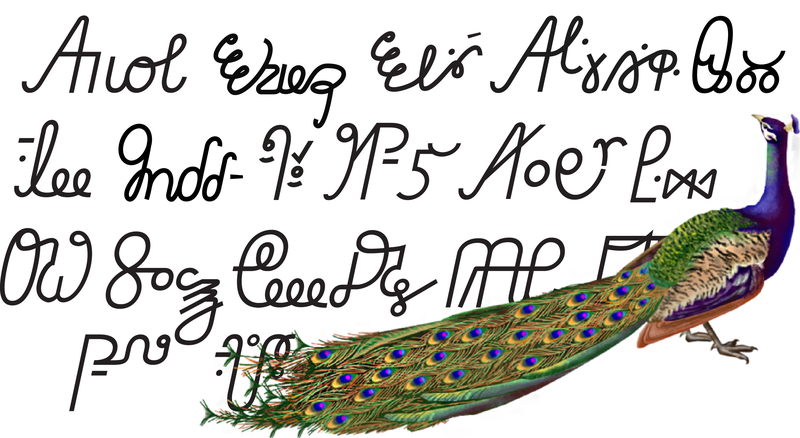 Much like Darwin’s famous example of the peacock’s tail, the Eskaya writing system is cumbersome and impractical but also attractive in its intricate excess—and it is perhaps this inelegant beauty that has ensured its survival as new generations continue to acquire the system nearly a century since it was first revealed.